Get Happy With a Refreshing Glass of Freshly Brewed Beer at Orion Happy Park! ♪ | Japanize! What's the first thing that comes to mind when you think about Okinawa? Beautiful blue sea and sky? Nuh-uh! It's gotta be Orion beer, right?! And while we're on the subject of beer, I'd like to tell you all about the Orion beer factory, Orion Happy Park! Orion Happy Park is located in the north of Okinawa Island (the largest of Okinawa's islands, known as Okinawa Honto in Japanese). I'm sorry, but designated drivers won't be able to sample the factory's freshly brewed beer. So if you're driving home after your visit, fill up on the sights and smells at the factory instead! Let's take a look! What's so special about Orion Beer? 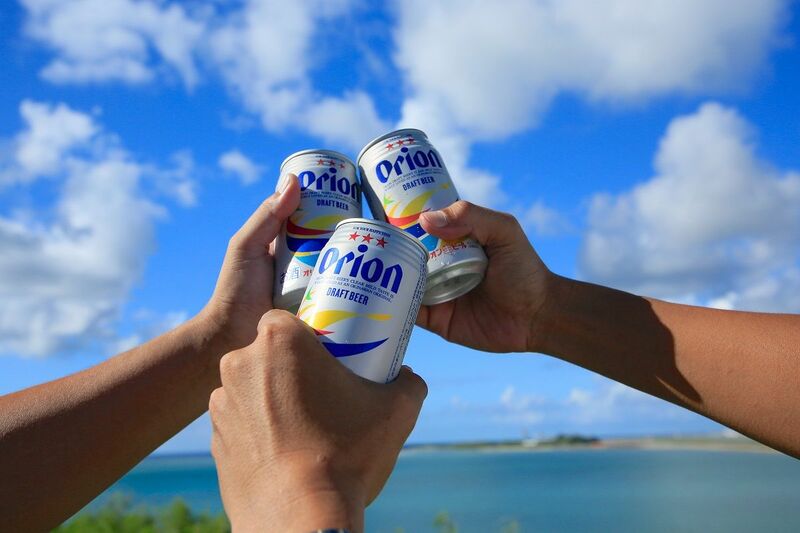 Orion Beer is Okinawa's proud locally brewed beer. The story of Orion Beer begins in 1957, and these days it's firmly established as an Okinawan classic. 2016 marks its 56th birthday, and there are 10 different varieties of Orion Beer in production. But the foundation of all these different brews is Orion Draft Beer. It's known for its mild flavour, making it the perfect refreshing drink for Okinawa's hot climate and cuisine! Orion Happy Park was originally the Orion Beer factory in Nago, an educational facility that was a popular sightseeing spot. It was renovated in 2011, and now visitors can enjoy factory tours as well as freshly brewed beer and meals made using local ingredients at the Yanbaru no Mori restaurant, and there's also a shop that sells original merchandise, plus more! Visitors can join the factory tour even if they haven't made a reservation, but as Orion Happy Park is pretty popular it's best to book in advance! As you step inside the building, you can't miss the giant brewing tank from when Orion Breweries was first established! Back then, copper tanks were the most popular, and apparently this copper tank was made using German technology. After you've excitedly checked in at reception, you'll have a little free time while you wait for everyone to arrive. But if you head on up to the meeting place on the second floor, you'll find a gallery and an exhibit about the history of Orion Beer, including a reproduction of a 1960s shop, so there's plenty of fun to be had before the tour begins. one on if you'll be driving home. They've really thought of everything! This badge features the Japanese for "designated driver", ハンドルキーパー, which is pronounced "handle keeper". The designated driver "keeps" the lives of their friends and family safe by "keeping" their hands on the "handle" (the steering wheel) and preventing drunk driving. This little cutie will make sure you don't drink any alcohol! As the tour start time rolls up, your tour leader will arrive and the tour begins. The tour takes you through the 8 steps of the brewing process of Orion Beer. First, you'll learn about the raw materials and secondary materials and the ratio of the ingredients. You can even have a sniff of the malt and hops. Hops certainly have a unique fragrance! Next you'll learn about the giant brewing tanks. The ingredients are bubbling away together inside. After the ingredients have been prepared, the next steps are fermentation, maturation, and finally filtration. You might be surprised by the sheer size of the fermentation tanks! Apparently, if you drank one 350ml can of Orion Beer every day, it would take you about 1,500 years to drink your way through one of these tanks. The next step in the process is bottling and canning, and with that the tour is over! After the factory tour you can sample some beer at the Yanbaru no Mori beer garden. At the beer counter, staff who are highly skilled in the art of beer will pour you freshly brewed beer! It's so luxurious! Plus, in addition to the beer sample you also get one refill, so you can enjoy two glasses of fresh beer. There are soft drinks available for designated drivers and underage customers, so nobody is left out! You can also order food at the restaurant to accompany your drink. Don't miss the Orion Beer merchandise! Beer season is finally upon us. Savouring a refreshing glass of beer underneath the blue sky is pretty special, but drinking a glass of freshly brewed beer at Orion Happy Park is a truly incredible experience! So pay a visit to Okinawa this summer and enjoy a glass of freshly brewed Orion Beer in the very place where it's made!